Again, additional awesomeness on the computer at Mockingbird HQ. Sorry for the bother, but happy Friday! The Market Square Farmer’s Market will kick off Tomato Month with a book signing and reading with Matthew Gavin Frank, author of Barolo, about his illegal work in the Piemontese Italian food and wine industry. Meet the author and taste a lovely tomato dessert from one of Matthew’s featured recipes. From Amazon.com: At once an intimate travelogue and a memoir of a culinary education, the book details the adventures of a not-so-innocent abroad in Barolo, a region known for its food and wine (also called Barolo). Upon arrival, Frank began picking wine grapes for famed vintner Luciano Sandrone. He tells how, between lessons in the art of the grape harvest, he discovered, explored, and savored the gustatory riches of Piemontese Italy…Rich with details of real Italian small-town life, local foodstuffs, strange markets, and a circuslike atmosphere, Frankâ€™s story also offers a wealth of historical and culinary information, moments of flamboyance, and musings on foreign travel (and its many alien seductions), all filtered through food and wine. The reading will take place August 2 at Old City Java at 7:00 PM. This is a fundraiser for the Market with suggested donation of $5 per person. In my cooking life I’ve had all these markers of recipes to avoid and when I stop avoiding them they become cooking milestones. At first it was recipes that called for a food processor, double boiler, chilling in the fridge for too long before moving onto the next steps, basically all these things that seemed like extra steps/time till I took the plunge. When you’re in a hurry, sure, these extra steps are impossible but when you’ve got time and something looks good go for it. It makes us better cooks and once I make the jump I’ll do it again until sometimes it becomes second nature! 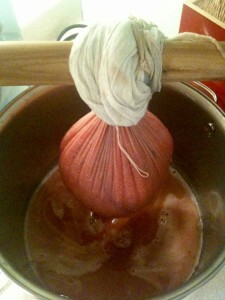 One of the hurdles I overcame recently was cheesecloth. I seriously would get to points in amazing recipes and see the cheesecloth and just turn the page. Now though it seems like I use it at least once a week. Making that tomato water on Monday I could have used my juicer but it doesn’t have the same effect as the finer and more delicate cheesecloth straining. Last winter I made Paneer, the very simple Indian cheese that is no more than 2 steps, the second one involves straining through cheese cloth. I’m sure there are many, many more uses for cheese cloth that I have yet to explore. If you have a special use send it on over. And even if you don’t go this direction, try something new in the kitchen! Last night I put together a happy hour for the Panic crew. It was a blast and totally full of summer goodness. Here’s the skinny. You can do this for 10 people in a couple hours probably. Quick, easy and full of right now flavors and ingredients. Juice part or all of a watermelon (these juices don’t last very long so don’t make more than you can drink in a few days). To juice the watermelon put the melon sans rind, in a blender or juicer. You don’t need to take out the seeds, just pass it through some cheese cloth or a thin strainer if you use a blender. This was way better than I thought it would be. I mean WAY better. I want one of these from here on out instead of a Bloody Mary. But it’s only as good as the fresh tomato water. The recipe says let it sit on its own weight and drain for 8 hours. You can press the juice through the cheese cloth all at once if you want. It’s about the same difference. Once I had all my juice I put in a teaspoon of smoky Spanish Paprika and a couple pinches of salt. Pour all ingredients over ice in a shaker. Gently shake, strain and serve. This is so good by itself I wouldn’t do anything else to it. But you could incorporate some pickles, olives, or basil or cucumber. When I was putting these together at the Theatre kitchen someone asked if these were a special Panic recipe because the basil looked like it could have been pot leaves. Funny. So you know the drill, boil the eggs, peel, scoop out the yolk. I mashed the yolk with Duke’s mayo, basil and rooster sauce to taste and salt and pepper. They were damn good. I called these BLTs for brevity. Really I used Allan Benton’s country ham instead of bacon. But the toasts were brushed and baked with Benton’s bacon grease. Sliced with fresh tomatoes, you can’t get much better. Pull all your ingredients together before assembling: brush bread with bacon grease or olive oil if you don’t have enough bacon grease on hand. Toast in oven at 350 degrees for about 15 minutes. Fry up the country ham. Slice your tomatoes and wash the lettuce. 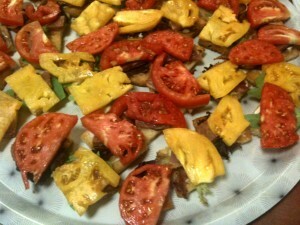 On the toast put some Duke’s mayo, the lettuce, the country ham and then the lovely summer tomato slice! I’ve posted about this before but did it a little differently this time. Get 10 oz of cheese, I used white cheddar. Get a jar of spicy pickles or hot chow chow (I used a mixture of both since I was making so much), and then fold in a few tablespoons of Greek yogurt. If you want a creamier consistency then add more yogurt. Serve with pita chips or crackers. 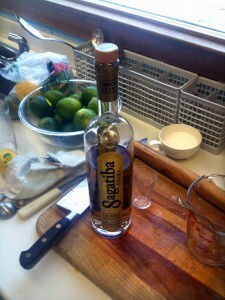 So the Caipirnha is a Brazilian specialty made with Cachaca, a native sugar cane liquor. As with most cocktails that make their way to this country I’ve had this drink a number of ways. With soda water, with simple syrup, with mint, without mint, with loads of lime pieces. Much like the mojito it is bastardized often. Sometimes this bastardization is not bad, the drink is still drinkable. Put the limes in a sturdy glass, pour the 2 tsp of sugar over and macerate with a muddler until the sugar dissolves. Pour Cachaca over the limes and mix. Strain out limes and pour over ice. This drink would be great with a dark rum or tequila if you can’t find the Cachaca. It’s a great way to beat the heat! 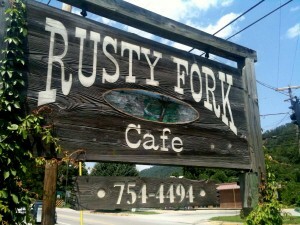 The Rust Fork Cafe is in Elkhorn City, KY. 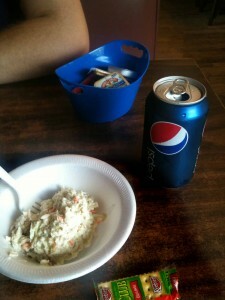 It is an awesome combination kayaker pit stop, local diner, and when we were there, 4-wheeler pit stop! It looks like it is now the only place to eat out in town. The pizza place has burned down since I was there last and there are no fast food places. Elkhorn is one of my favorite towns back home. It is the gateway to the Breaks Interstate Park, one of my favorite places on earth. The restaurant is on the Rusty Fork of the Big Sandy River, it’s got class 4 rapids during a river release that happens every October and is abosolutely so beautiful. We went swimming and had a great diner meal. The biggest revelation here, which I thought semi-southern or at least common, was the slaw, club crackers, and butter. Carlos had never heard of such a combination and then I asked around later that evening and it seemed a common response. Growing up at Jerry’s or any diner type place the slaw always came out first, as the salad, and was served with club crackers and butter. You put a little butter on the cracker and then eat it with a bite of slaw. It is delicious. 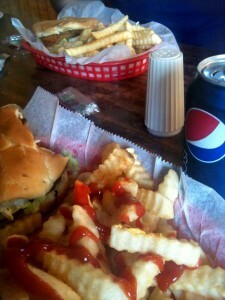 After our slaw we had a cheeseburger and fish sandwich and PEANUT BUTTER PIE!!! That is my favorite pie ever. This wasn’t the kind I grew up with but it was delicious nonetheless. It was a peanut butter cream with chocolate sauce on the top and a graham cracker crust. We ate the pie down at Ratliff’s Hole, the swimming hole. Twas a lovely day of old haunts and nostalgic food. We are not open, but we are getting closer. Please sign up for us on Facebook and Twitter to be the first to know about our progress and opening parties! After that we’ll keep you posted on drink specials and special events. 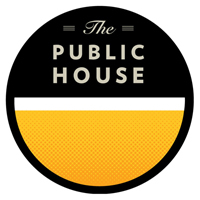 Posted in Uncategorized | Comments Off on THE PUBLIC HOUSE!